It wasn't only yesterday's quail that reproduced like crazy. My Christmas scraps have done the same thing. Those 99 stockings I cut out produced scraps. Those scraps were put together to make six patchwork stockings. 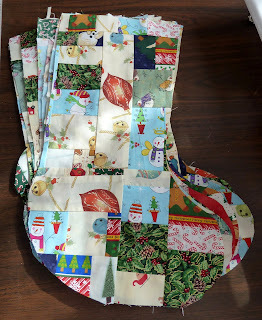 The creation of those patchwork stockings created even more scraps. Those scraps were then put together to make six more stockings. I thought I was done until I turned around and looked behind me. I still have scraps from the Elvis-themed Christmas stockings. Guess more patchwork (and scrap) stockings are in my future.